The hosts struggled to create chances of note amid a lacklustre 0-0 draw at the Aviva Stadium. 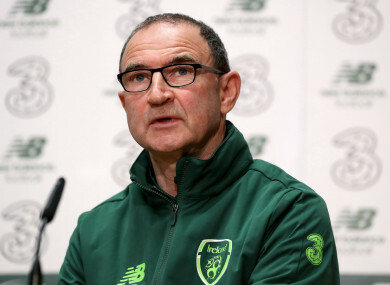 REPUBLIC OF IRELAND boss Martin O’Neill admitted he was disappointed with his side’s performance going forward tonight. The hosts drew 0-0 with the North at the Aviva Stadium and it could have been worse were it not for a couple of excellent Darren Randolph saves. “We didn’t create enough going forward and had a few moments of sloppiness ourselves,” O’Neill told reporters afterwards. “We didn’t get on the ball enough, there were too many mistakes from us. Certainly in terms of going forward, we should do better. Not for the first time, the Ireland boss cited his side’s “lack of a goalscorer” as an issue, though he partially defended the 3-5-2 system he has deployed in recent times. O’Neill, meanwhile, played down concerns that the wing-back roles were not getting the best out of Seamus Coleman and James McClean, who are primarily regarded as a full-back and winger at club level. The Ireland boss also confirmed that Sean Maguire, who went off injured tonight, has suffered a recurrence of a hamstring injury that kept him out of action for a considerable period previously, adding that it was too early to determine the seriousness of the injury. Email “Disappointed Martin O'Neill admits Ireland not good enough going forward”. Feedback on “Disappointed Martin O'Neill admits Ireland not good enough going forward”.